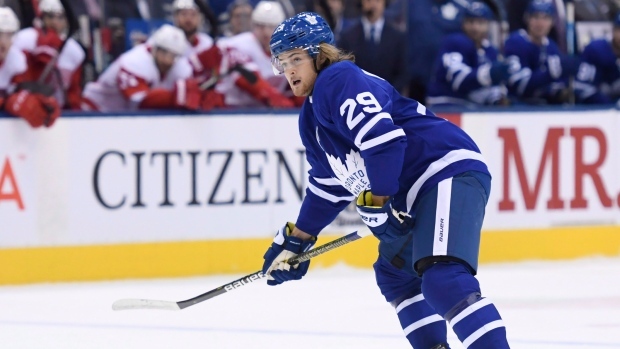 After opening Thursday night’s game on a line with Auston Matthews and Patrick Marleau, William Nylander skated on the third line during Friday’s Toronto Maple Leafs practice. In his season debut, Nylander did not play the final 11:37 of regulation or overtime as the Maple Leafs fell to the Detroit Red Wings 5-4 in the extra frame. He practiced on a line with Nazem Kadri and Connor Brown, while Matthews skated with Kasperi Kapanen and Andreas Johnsson. Marleau did not practice on Friday, leaving Tyler Ennis, Par Lindholm and Frederik Gauthier to form the fourth line. The line of Zach Hyman, John Tavares and Mitch Marner once again remained untouched. Matthews skated with Johnsson and Kapanen for the final 10 minutes of the third period on Thursday and the trio combined for a goal to cut the score to 4-3. Babcock said after Thursday's loss that the team may have asked too much of Nylander in his return. "I thought Willy was fine," Babcock said. "It was probably unfair for me...we never even gave the guy a practice. He had an opportunity we felt to get going, we tried to get going. It has nothing to do with Willy; it has to do with me wanting to win the game." The Maple Leafs will visit the Boston Bruins on Saturday night.